Anderson, McLean ; Desnoyers, Sarto ; Macdonald, John ; Brault, J.R. 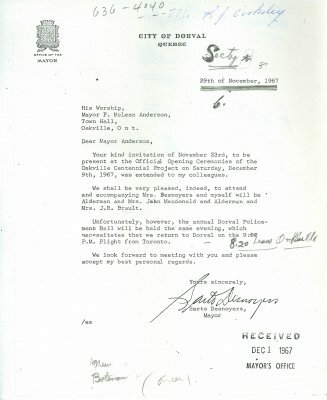 Your kind invitation of November 23rd, to be present at the Official Opening Ceremonies of the Oakville Centennial Project on Saturday, December 9th, 1967, was extended to my colleagues. We shall be very pleased, indeed, to attend and accompanying Mrs. Desnoyers and myself will be Alderman and Mrs. Jebn Macdonald and Alderman and Mrs. J.R. Brault. Unfortunately, however, the annual Dorval Policemens Ball will be held the same evening, which necessitates that we return to Dorval on the 9:00 P.M. Flight from Toronto. We look forward to meeting with you and please accept my best personal regards.